The most important element of the exhibition Division of Labour is putting talk into action. The mission of the exhibition is to work toward a zero-waste outcome. As part of this, the Artist Material Fund will open right after Division of Labour closes. Materials collected from the artists’ construction and from surrounding cultural institutions will be given away to artists and individuals in the community, rather than finding their way into the local landfill. People will have the ability to take away any and all material from the installation as well as other items, including equipment and fabrications slated for disposal from other cultural institutions in the area. The Artist Material Fund approaches recycling and trash collection as an artistic endeavour. Its mission is to relocate material and diminish waste that is produced from the art industry while providing resources to artists to produce work in a financially viable way in cities that are becoming increasingly hostile to individuals in lower-income brackets. The program seeks to actively cultivate an environment that supports and promotes the sharing of underused goods to exploit their full potential value. It also acts as a redistribution centre so that artists can “shop” for items they need to complete projects and build more efficient studios. Division of Labour runs from January 30 to April 20, and is curated by Suzanne Carte. 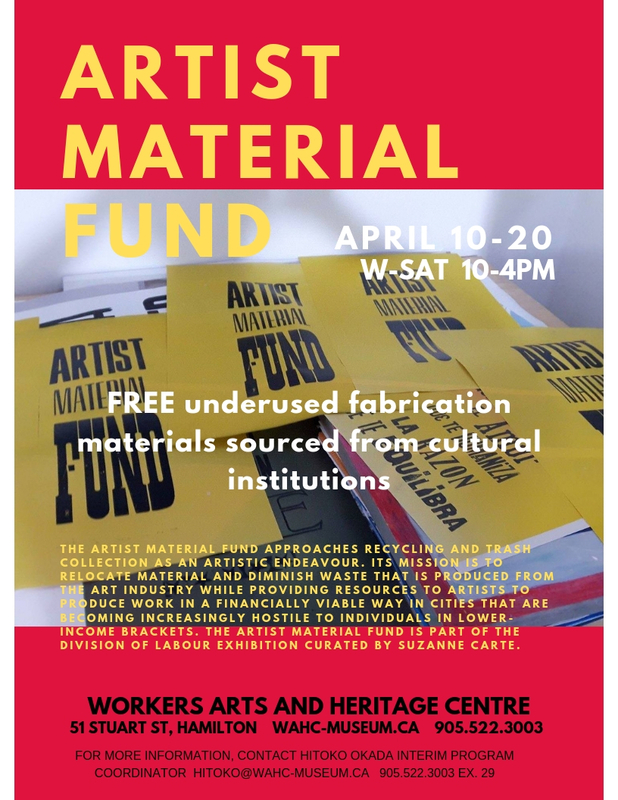 The Artist Material Fund is open to the public from April 10th – 20th, Wednesday to Saturday, 10 am to 4 pm, closed on statutory holiday Friday April 19th. Please bring a bag or box to carry your findings to their new home. Check out our Facebook feed for regular postings of highlights and treasures found in the Artist Material Fund! WAHC acknowledges the Canada Council for the Arts for its support of the Main Gallery exhibition program, and the Ontario Arts Council for its support of Division of Labour.